It is rare indeed for a new Western Rite mission/group to start out with enough money to obtain a large church. Old churches are frequently a maintenance problem, and building a new church is expensive. Renting takes the money which could otherwise be saved towards building. And then there’s the land – land is expensive. There are temporary ways though. Believe it or not quite a lot of parishes both Eastern Rite and Western Rite start out in converted garages, garden sheds, basements and lofts. And these places don’t have to be hardships. They can, with thought and taste, be made into beautiful small places of worship – often so beautiful that people are reluctant to leave them when the opportunity/money is available for a larger church. So we decided to put here – over time – ideas for small chapels and good quality do it yourself work. You’ll be surprised what can be done. 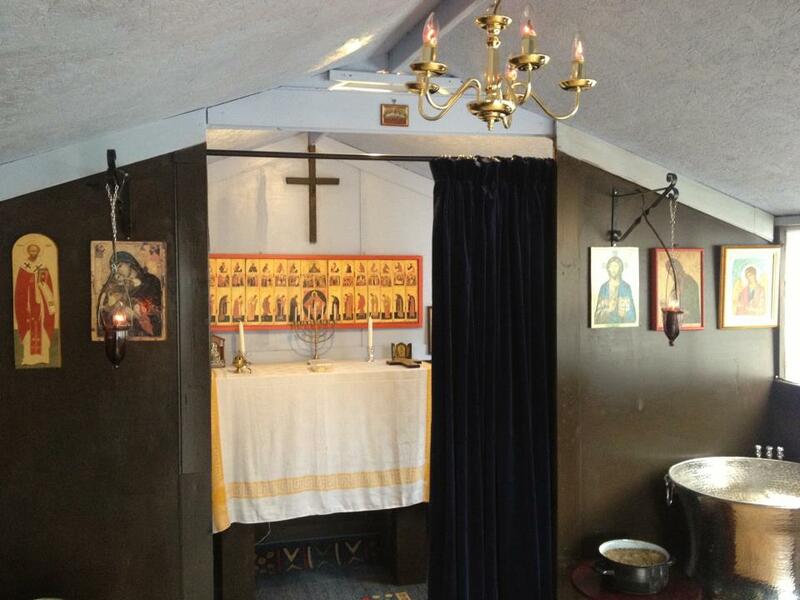 We will soon be putting here pictures of a small chapel (16-20 people) built on private land for £2,500 – icons included. The church can be doubled to take a good 40 people for an extra £1800. £4,200 for a church that takes at least 40 people. How many parishes have that many people? We are a remnant of Christianity in the west. We are the people who will greet Christ at His second coming. A redundant Church of England church will cost at least that amount in maintenance EVERY year. However grand it may be – can we justify that? Will Christ ask us about the grandeur of our church – or about what we did for our damaged and sick neighbours? First of all, there is the problem of land. We know of numerous Orthodox parishes that have started and gone on for years in private premises, before they had the opportunity to buy land and build, or buy a building. If you have access to some private land, then there is the problem of the local Council and its regulations. Most Councils permit the building of a non-permanent wooden shed without seeking specific Council approval (check your local Council). 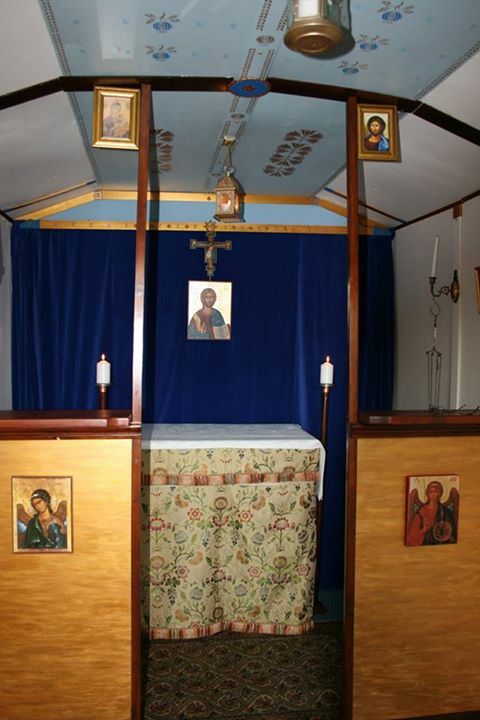 We know of at least four Orthodox parishes/missions which used garden sheds as chapels – some still do – and we know of others intending to start doing so. So we will share here with you, the ideas, problems and ways around that we have come across. 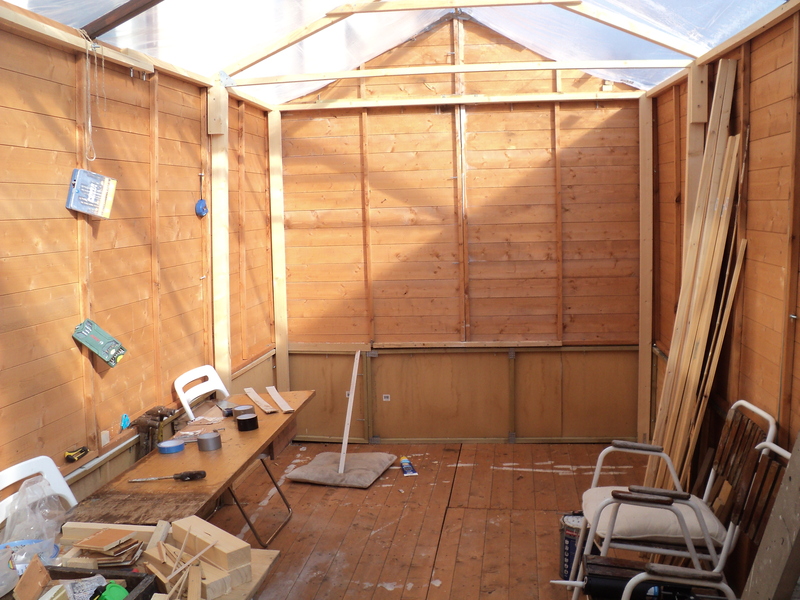 So we are starting from scratch, building a bought wooden garden shed. Some questions need to be asked: How many people to start with, how many expected within a year? How temporary do we envisage this to be? Five years? Ten years? Two years? Lets assume that you simply don’t know how long you’ll need it and you can forsee no sudden influx of money. Lets assume you are starting with under a dozen people, but expect say 20 by the end of the second year. Now what kind of garden shed? Let’s start by saying that ALL garden sheds on the market are cheap (no matter how relatively expensive) using cheap materials and badly executed. You are better off, if you have at least one experienced DIY man, to design and build your own garden shed. Below here, we show a picture of a basic structure. With a base – which if it is to be temporary is a wooden platform. The Eaves are about 9-10 feet high and the pitch of the roof increased to reach 14 or so feet. Bays can be added, and the pitched end eliminated. The idea though is a simple structure that amateurs can build. The walls can be filled in with wood weatherboarding, slab wooden/insulation/plaster board panels – or bricks. While the structure may be simple, the interior can be made exquisite with care and good taste. The important thing is not to cram it with “stuff” – simple is better. Here in this chapel above, the structure is up, but as yet unroofed. The chapel will take up to 20 people and can be extended. Eaves are 7 foot and the roof ridge is 9 foot. You can see where the screen will be. Here is a photoshopped version of an existing similar sized Orthodox chapel in a basement. It is photoshopped because some things have been added and some re-arranged. Here is another chapel – basically a wooden garden shed newly bought and then finished as a chapel. The Priest and Deacon Prayer Desks are used at Mattins and are inside the Rood Screen. 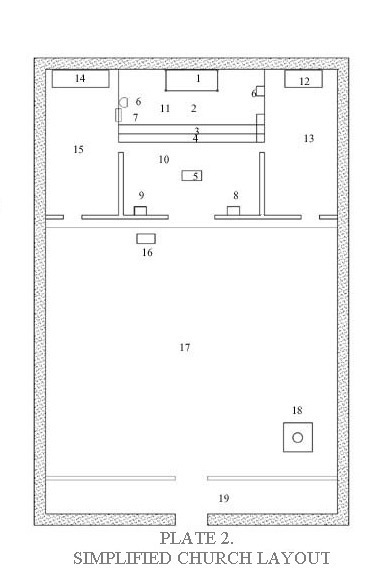 Obviously this is “ideal” – small chapels won’t have it all. Here is an Altar – made by an amateur using bannister uprights from a local Do It Yourself store, plywood and one expensive piece of wood for the mensa itself. Then all is stained and polished. The Altar has a frontal on it and the result is very good. The Altar mensa ought properly to be at a height one inch below the Priest’s bent elbow – and NO lower. 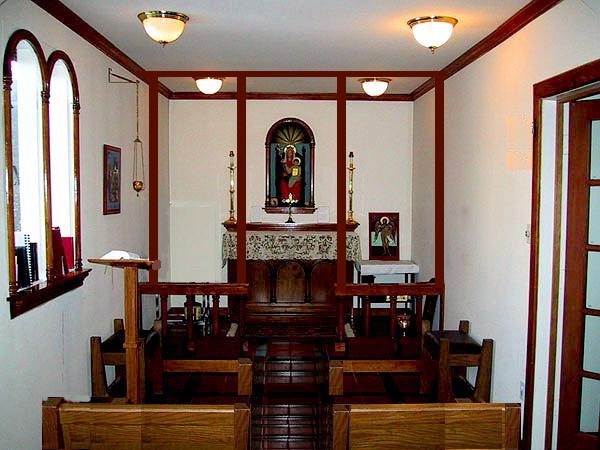 While it is not our use to have a Roman-style tabernacle, the wooden box shown above is a proper place to hold the reserved sacrament IF the church is close to a hospital. However a better solution is an Aumbry let into the north wall of the the Sanctuary. 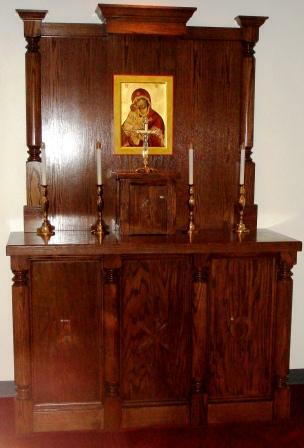 The Credence need not be an expensive table – a simple wooden shelf affixed to the wall to the right of the Altar often looks better – less cluttered. 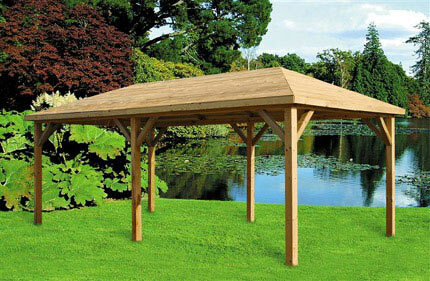 Make sure it is big enough for its purpose and supported with elegant brackets. Often painted plain white works well. 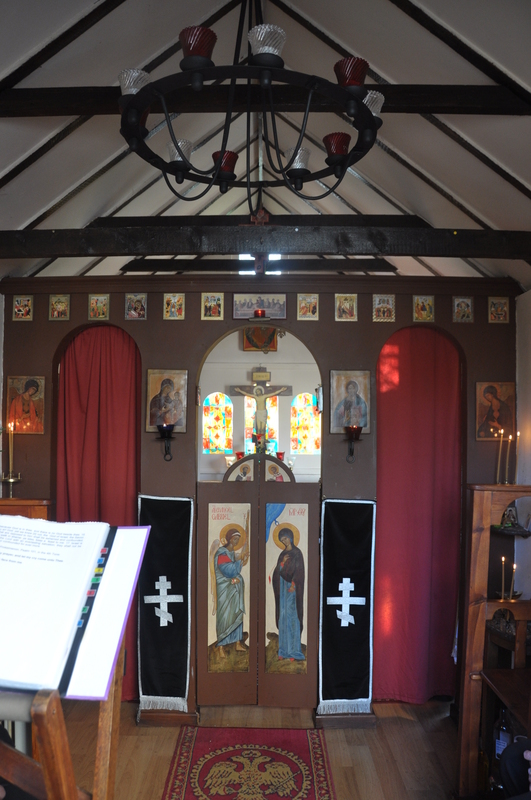 The thurible can hang from a curtain rod bracket (like the lamp in front of the icon in the chapel pictured above) fixed to the wall at an appropriate height – this will; hold it far enough away from the wall. If it is fixed in proximity to the Credence, then the incense can be kept on one end of the credence. It is always worthwhile to put two rugs in front of the Altar (especially if there are no steps) to make it easier for the Priest to stand for long periods there. The top one should be of plain non-intrusive colour.